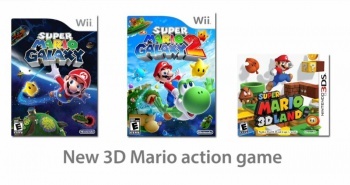 There's also a 3D Mario game in the works. The Wii U was the first Nintendo console to launch with a Mario title since the Nintendo 64 in 1996, but it was a 2D platformer. Don't get me wrong, New Super Mario Bros. Wii U is excellent, but it didn't sport the 3D world the Mario series has been exhibiting since Mario 64. This morning, in an announcement from Nintendo President Iwata Satoru, we learned the team behind Mario Galaxy is working on just such a game for the Wii U. There's also a new Mario Kart in the works, and I'm happy to report both titles will be in a playable form at this year's E3 in June. In other words: I can't wait for E3. "Our EAD Tokyo team, which created the Mario Galaxy series for Wii and Super Mario 3D Land for Nintendo 3DS is working on a new 3D Mario action game for the Wii U," Iwata said in a Nintendo Direct video. "We are also working on Mario Kart for Wii U, a series which has seen one installment for each hardware system we've released." Of course, Iwata is forgetting there was no Mario Kart on the original Famicom 8-bit system or the Gameboy, but that was before his time, I guess. In any case, I'm excited for both of these games. I've played the crap out of Mario Kart games and I'll expect to do the same for the Wii U one when it comes out. No release date announced yet, but if they are playable at E3 I imagine we'll see them on store shelves for the holidays in 2013.